Mino Washi Akari Art Expo. (美濃和紙あかりアート展) is an art of festival held in Mino City, Gifu. Akari Art is an art of the light created with Mino Washi Paper. Because Mino is very popular for it Washi, people come up with the idea of this art. In the middle of October, over 400 arts that designed from all over Japan and world, and light up the traditional town of Mino for two days. The road will be restricted, but there are special parking space during the festival. It's held in Middle of October. Light up starts from 17:00 to 21:00. 1. walk north 10 min. Map around Mino Washi Akari Art Expo. Mino Washi Akari Art Expo. is one of the biggest event in Mino City. It started in 1994 for the activation and development of Mino city by using the local products, Mino Washi paper. Mino Washi Paper has the history of 1300 years. It is held on the weekends during the middle of October. Akari Art is an art of the light created with Mino Washi paper. 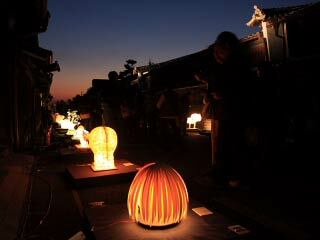 Every year, about 400 arts display and light up, Udatsu no Agaru Machinami, the traditional town of Mino. This art show of light is also a contest. They compete the creativity, how well organize with the Washi, and warmness of Washi Paper. It is one of the splendid art festival of light. If you want to join this art show, check out the official web site.